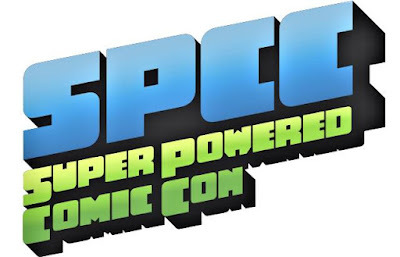 The first Super Powered Comic Convention is coming up this Saturday, September 8, 10:00 am to 4:00 pm, at South Piedmont Community College in Monroe, N.C., where I am Department Chair for Humanities and Social Sciences. If you live in the area, I hope you will attend! 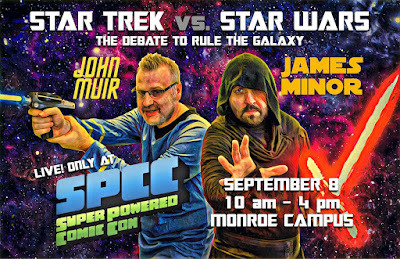 There will be lots of vendors present, and also the Star Trek vs. Star Wars debate, between myself and James Minor, the Dean of Arts and Sciences. The event is covered in a local paper, Union County Weekly: "Superheroes Gear Up For College." "Super Powered Comic Con will offer fans of geek culture the opportunity to buy comic books, listen to panel discussions and enjoy the thrill of cosplay. John Kenneth Muir, department chair for SPCC’s humanities and social sciences department, has written at least 27 books on horror and geek culture, including “A Critical History of Doctor Who on Television” and “The Encyclopedia of Superheroes on Film and Television.”.. ..The convention occurs on the same day “Star Trek” debuted on television 52 years ago. The show lasted just three seasons, but became a cult classic that spawned a cinematic universe and a handful of television reboots. 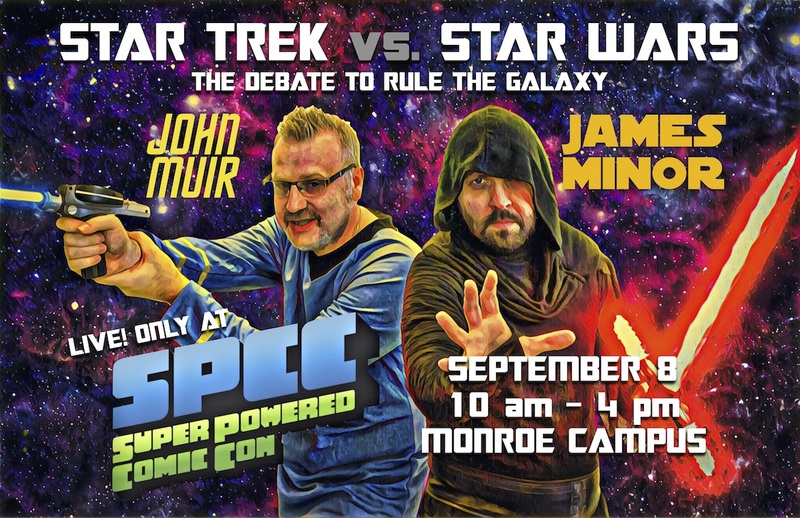 Muir will debate the virtues of “Star Trek” in a panel discussion that pits the franchise against box office juggernaut “Star Wars.” James Minor, dean of SPCC’s arts & sciences, will defend “Star Wars” during the discussion..."
Go Team Muir! Defend Star Trek's honor in the debate.